Indian corn has always been a favorite decoration, and this Bubble wrap Indian Corn is pretty and a fun medium for kids to work with. 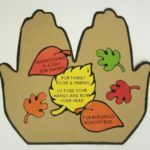 Fall is the time of year when we think of Halloween and Thanksgiving crafts and this craft is perfect for both. Click on Printables and print out corn pattern and cut shape out of bubble wrap. Dribble yellow and white paint on wax paper. Spread with craft stick to fill an area slightly bigger than your shape. Press bumpy side of bubble wrap into white and yellow paint and press onto construction paper. With paintbrush paint some of the kernels with black or red paint to give the look of Indian corn. Use the picture as a reference. Peel off (For corn make 3) Cut out, glue ends together.